Being from an Italian and Brazilian family I know how much Easter means to us. I also know that my family enjoys sweets. My father is a baker. He would always bake different things for us. I remember him making this and I am not sure where he got the recipe; maybe from my grandmother or maybe its was his own creation. I do know that in Italy they make a lot of different pies, cakes and cookies with Ricotta. The texture of this delight reminds me of cheesecake but it’s lighter and fluffy. This pie can be enjoyed anytime of the year. I figured I would give it a try to share it with you, and hope you enjoy. Blend 3/4 cup of powdered sugar, eggs, vanilla, orange zest,lemon and ricotta in a food processor until smooth. Stir in the almonds. Set the mixture aside. Lightly brush some melted butter in a pie dish. Lay 1 phyllo sheet over the dish and up the sides, allowing the phyllo to hang. Brush the phyllo with the melted butter. 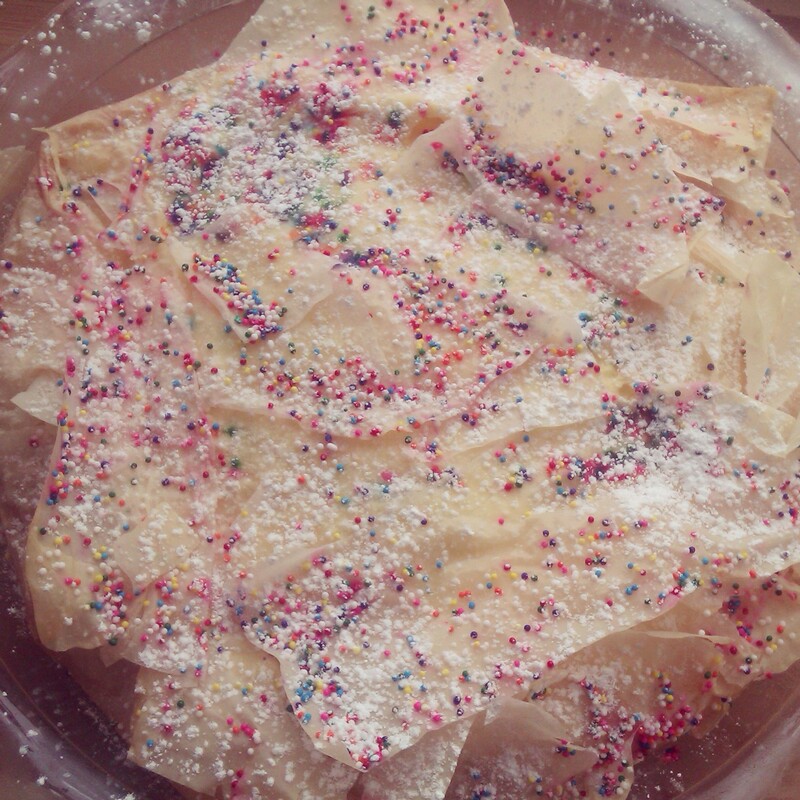 Top with a second sheet of phyllo, laying it in the opposite direction as the first sheet. Repeat the process until you have reached the amount of Phyllo sheets you would like. Pour the ricotta mixture into the dish. Fold the hanging phyllo dough over the top of the filling to enclose it. Brush it completely with melted butter. Sprinkle the sprinkles. Bake the pie until the phyllo is nice and golden brown about 30 to 35 minutes. Transfer the pan to a rack and cool completely. Sift some powdered sugar over the pie and serve. You can also enjoy it with some different type of marmalade. looks great- I had ricotta pie for Easter too! it soo delish isnt it? You are my kinda cook. I’ve already tried one of your recipes. Have bookmarked a couple more. This one is also a keeper.